Planning a Bolivian Death Road trip? Use this as a checklist of things you need to know about the world’s most dangerous road when planning your travel or biking trip. Use the links above and below for more information. 1. The Bolivia Road of Death lives up to its name. Between 100 and 300 people die in accidents on this road each year, including tourists who sometimes don’t heed the warnings about how dangerous biking the road of death really is. Be sure you really want to do this and are in good health and top shape. 2. If you don’t plan on taking a biking tour but still really want to see the sites of the famous death road Bolivia has other ways of getting there. You can take a bus, taxi or passenger van, although there is also a new road to Coroico and other towns that avoids the Bolivia road of death. See the information below on getting there. 3. Be sure you can withstand high altitudes. Located over 4000 meters above sea level between La Paz and its northern Yungas (jungle) region, you’ll drive to the Cumbre (the summit) of the Andes before you head downward to the rainforest regardless of whether you take the new road or the old road (death road). Read about altitude sickness here and what you can do to get relief. 1. Sunglasses. If you’re biking they’ll keep the wind out of your eyes too. 2. Sun block. Biking the road of death takes 4-6 hours outdoors. 3. Moisturizer. This is an extremely arid region and your skin will dry out. 4. Bottled water. You’ll find little roadside kiosks along the way but sodas are more abundant than water and only have mineral water. 5. Warm clothing. In the highlands it is very windy. Although it may be warm during the day, nights are very cold. Dress in layers so you don't sweat or freeze. 6. Sleeping bag. If you take a bus, taxi or passenger van to the Yungas at night it’s really really cold. A jacket may not be enough. 12. Lots of cash. Between La Paz and Coroico you’ll only pass through tiny remote villages. There aren’t any banks. Coroico is growing, but only has one bank and no automatic teller that takes international debit or credit cards. You can get a cash advance from your credit card at the bank but who wants to pay those interest rates? 13. Rain jacket You’ll be heading from the Andes into the rainforest. In addition, if it’s the rainy season you’ll want to cover up when your bus makes rest stops. There is also always the risk of landslides which often leave vehicles stranded for hours. 14. Proper cellphone. If you plan to bring your international cellphone, you should know Bolivia uses a different system than many countries. Read more about that below. Cellphones usually don’t work along the road but as you near Coroico they might. 15. Insect repellant The Yungas (jungle) are full of insects big and small. Big horseflies, tiny almost invisible gnats, mosquitoes, and other bugs have especially painful bites. Tuck your pant cuffs into your socks too. 16. Swimsuit Some biking tours end with a free lunch, shower and swim in a hotel pool, or if you plan on spending the night in Coroico there are several nice hotels with pools. It’s hot here! 15. Cameras, batteries, battery chargers, cellphone charger, electric current converter and if you use a digital camera, extra memory cards. The electricity in Coroico is 220. I recommend a solar cellphone charger. The Cumbre (the summit in the Andes mountains) is cold all year round, but coldest during our winter months (June to August). However, that’s also our dry season and one of the safest times to travel. Our rainy season is between November and April and that’s the most dangerous time to travel death road and it experiences more landslides, rock slides and slippery, muddy conditions. The first half of your trip will be cold. Once you pass the Cumbre you generally head downward toward the Yungas, or jungle region. However, this very peculiar rainforest is still over 1500 meters above sea level. The Yungas are warmish to extremely hot 9 months of the year and warm to coolish between June and August. Since the trip covers both crossing the Andes and going down into the rainforest, you have to dress in layers so you can peel them off as you enter the warmer region so you don’t freeze at the beginning or overheat when you arrive. The second half of your Bolivian death road trip will be hot. I like to time my travel to arrive in Coroico very early in the morning when the views are unforgettable! However, the region is most and fog is dense. I choose this because the view of the clouds hanging below you and the mountain tops sticking up out of them is absolutely unforgettable. Usually I take a car. Biking tours typically leave La Paz in the early morning and arrive in the early afternoon. October 20th is Coroico’s foundation day and there is typically a cultural festival with typical foods, music, dancing and lots of drinking into the early morning. The Yungas has a very warm climate. Coroico’s elevation makes the climate ideal and moderate throughout the year. Temperatures vary between 20C and 8C between September and December, between 21C and 12C between December and March (the hot rainy season), between 20C and 7C from March to June, and between 20C and 5C from June to September (the cooler dry season). Click here to see the weather in Coroico today and for the next 15 days. Click here to see more about the climate in Bolivia. 1. The Bolivian Death road biking tour is for you if you are healthy and fit. If you are not, you may want to consider taking the newer highway by bus or passenger van to Coroico. 2. Carry cash as along the road you’ll encounter only small villages and won’t be able to use our credit cards. There are no banks until you get to Coroico. 3. Death road is dangerous. You must always follow your guide’s instructions about passing cars and keeping a moderate speed. 4. Don’t drink alcohol or do drugs on this trip. It could cost you your life. There are also several narcotics check points along the road. 5. Many tourists don’t know this but by law in Bolivia you must carry your documentation at all times. 6. Choose a guide you can communicate with and understand. Choose a guide who has all the safety and rescue equipment necessary and gives you proper training. What’s the point of paying less if you can’t understand anything on the trip. 7. Because the Bolivia Death Road is a one-lane road, cars going one way have the right of way. Cars going the other must stop to let them by and they stop by the edge of the road, not on the inside of the road. Passing is dangerous. Follow your guide’s instructions to the letter. 8. All along the edge of the road you will see stone altars and crosses. Each marks a place someone has died. 9. Rock falls and landslides are not uncommon. During the rainy season the road is muddy and slick. There are two spots where waterfalls pour onto the road, making it slippery, and eroding it. 10. I recommend travel insurance if you're planning to travel take the Bolivian Death Road. I never used to but now sadly here's why. 11. If you need health care, Coroico has one hospital and there are several pharmacies around the main plaza. There are no health facilities in along the road. 12. You don’t have to worry about dengue or malaria in the Coroico area. If you choose not to take a bike trip, there are taxis, vans and buses that depart daily from La Paz heading to the town of Coroico. These buses leave from Avenida Las Américas in Villa Fátima which is located in the northern part of the city of La Paz. Take a micro bus up Avenida Busch and passing Plaza Villarroel to Villa Fatima where the bus station is located. Biking the road of death? Find Bolivian death road tour operators. DEATH ROAD HOME PAGE Although it is only really about 90 miles from La Paz to Coroico, the Bolivia road of death is carved around each mountain. The road winds up and down the sides of several mountains in a zig zag pattern, then curves around each mountain and on to the next where the zigging and zagging begins anew. It has a total of over 200 hairpin turns! Begin by visiting our Death Road Home Page. INFO Get information about how to prepare, what to take with you and how to get to the World's Most Dangerous Road on this page. The Bolivia Road of Death lives up to its name. Between 100 and 300 people die in accidents on this road each year, including tourists who sometimes don’t heed the warnings about how dangerous biking the road of death really is. Be sure you really want to do this and are in good health and top shape. 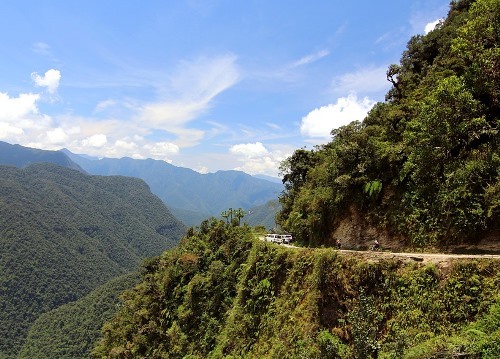 TOURS Bolivia Road of Death Tours take place along what is known as the Camino de la Muerte, Camino a los Yungas, and Camino a Coroico, a road which was declared the world’s most dangerous road by the Inter-American Development bank in 1995. This page has a detailed description of the road the bike tours take and some of the stops you may make along the way. FORUM In our Death Road Travel Forum you can ask questions about this tour or share your own experiences and photos or videos of the World's Most Dangerous Road. You can also post travel stories, upload photos or videos, or share your experiences on the world’s most dangerous road. PHOTOS & VIDEOS In our Death Road Photo Gallery you’ll find documentary videos and homemade movies and photos of the “Camino de la Muerte”, the most dangerous road in the world. And be sure to take a look at this Map of Death Road for a geographical perspective.